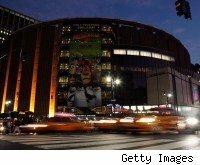 The New York state senate has voted to pass a bill that will sanction mixed martial arts in the state. The bill, 1707-A, passed by a 42-18 vote after a little debate on the floor in the state capitol building in Albany. That victory represents just the first step to becoming New York law. It will now move on to the State Assembly, considered a much tougher audience for MMA. In 2010, the same bill passed the Senate but never made it to the floor for an Assembly vote after the state's legislators were bogged down in budget problems and other issues. Among those voting for the bill was John DeFrancisco of the 50th district. "I just think the reason in inescapable," he said in voting for the bill. "The public wants this type of activity. The public has this type of activity in 45 states. We in the state of New York are fighting with budget problems and ignoring the ability to please people who want to see this activity, mixed martial arts events, and we're losing revenue. It seems it's a smart thing to do, the right thing to do." In recent months, the UFC has turned up efforts to get the sport regulated in the state. In January, the promotion held a press conference in Madison Square Garden promising the state two events within the first year of legalization. The UFC has attempted to use its financial clout to sell the sport in the Empire State. A study prepared by HR&A Adivsors, a New York-based consulting agency, found that sanctioning the sport would generate about $23 million in economic activity in the first year. Adversaries, led by Assemblyman Bob Reilly, have countered with polls saying that 67 percent of New Yorkers oppose the state sanctioning MMA. A recent MMA Fighting report also noted the role of Culinary Union Local 226 and parent company Unite Here in opposing MMA in the state. With the State Senate out of the way, the State Assembly proves a much more difficult roadblock to negotiate.